BOOK YOUR LAKE TARPON TRIP NOW! side of Tampa. But is regarded as one of the top bass fishing lakes in Florida, boasting healthy populations of largemouth bass, bluegill and crappie. 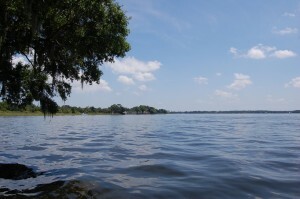 Lake Tarpon is situated in North Pinellas County just a few miles from the city of Tarpon Springs. 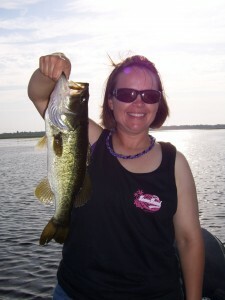 It is renowned for its trophy-sized largemouth bass and on occasion producing ten-pound bass! The city of Tampa and the surrounding area in Florida can provide a variety of saltwater fishing opportunities, but if you need a break from the harsh saltwater environment or if the wind is making it difficult to fish consider freshwater fishing for largemouth bass. Whether you are a Tampa resident, vacationer looking to get away from the hustle of the city, or on business looking for a trophy fish, bass fishing is a fun and healthy outdoor activity that can be enjoyed by relative novices anglers as well as lifelong pros. Because of its location, on weekends the lake hosts many bass tournaments. However only a few of us knowledgeable guides fish the lake on a daily bases, and we encourage our to fish during the week if there schedule permits. For many years Lake Tarpon has held the Florida state record for largemouth bass that was caught using a wild shiner for bait. The lake is nearly nine miles from end to end, covering a total over 2,500 acres. Surrounded with houses and resorts there are lots of fishing opportunities. The lake bottom has deep-water holes and the shallow edges are lined with grass beds. In addition to good bass fishing the lake has a thriving population of Bluegill, Crappie, Blue Tilapia, Catfish and Sunfish. The daily bag limit for largemouth bass is five, and only one of the five may be over 22 inches long. This more conservative fishing regulation, together with environmentally minded angling has helped preserve the stock and thereby improve the overall quality of bass fishing in Lake Tarpon has proven to be very successful. Two county parks border the lake, to the east John Chestnut Park and to the west A.L. Anderson Park. These parks form a natural complement to the tranquility of the lake and provide numerous comfort areas and, if needed, shelter from inclement weather for boaters and fishermen. Both parks offer an abundance of recreational facilities including picnic areas with grills, play equipment, walking and cycling trails, and boat launching facilities. Anderson Park is characterized by hilly terrain, wooded areas, and beautiful vistas overlooking Lake Tarpon - an ideal location for restroom and lunch breaks from a hard days fishing. Lake Tarpon Resort 727-942-0358 (formerly Best Western), located down the canal just North of Dolly Bay. Docking on canal to lake. Dockside Sports Bar and Grille 727 934-3700 (formerly Hemingway's) - part of the Lake Tarpon Resort.